Clare Lynch: Welcome to episode two of the Soho Then photo-based podcast. I’m Clare Lynch, audio producer and Soho resident. This programme consists of six themed episodes released monthly from December 2018 to May 2019. Each episode has a corresponding collection of photographs that you can scroll through as you listen. 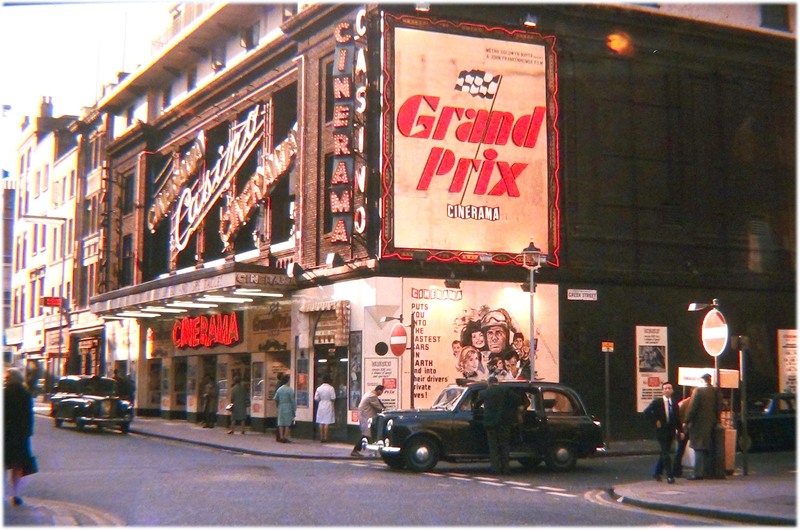 In this episode we explore the topic of Film and Cinema in Soho’s past. 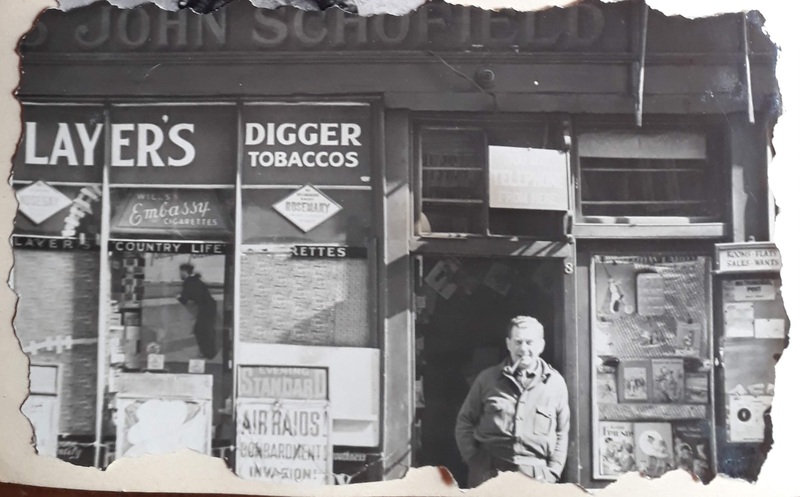 Leslie Hardcastle and Pamela Power are our guides with contributions from former and present-day residents and workers sharing their memories of Soho from twenty or more years ago. Leslie Hardcastle: My name is Leslie Hardcastle. I was born in Croydon, I’m 91 years of age. I’m still young at heart. The body is a little different. I worked in the film industry in Soho. Anyway, my Uncle was an actor, not a particularly good one, but one who appeared in 117 British films. Actors don’t always have jobs so he had a back-up as a toy and a sweet shop, which was great for me ‘cause he was my very, very fond uncle. And I used to come up from boring old Croydon. We used to come up here, in Newport Place, and sort his sweet and soldier stock, toy stock, out, which was a delightful thing to do. 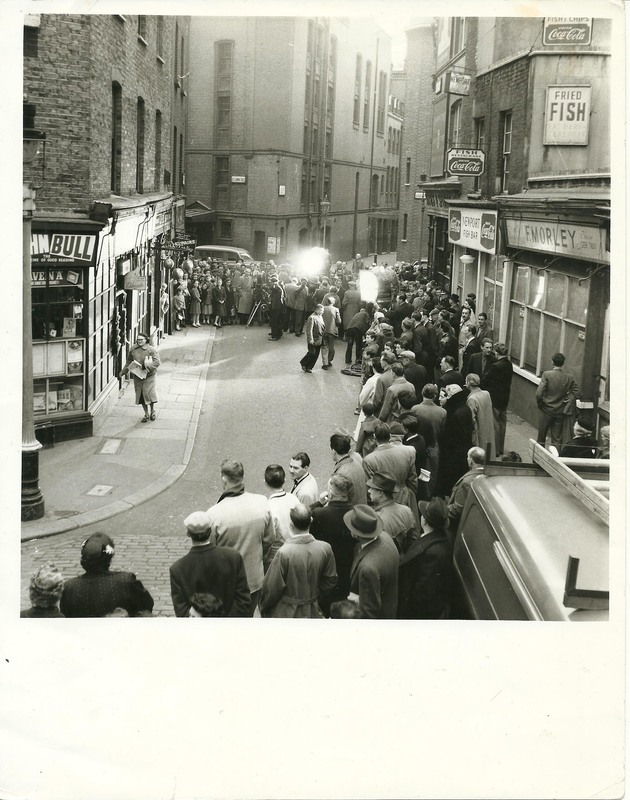 The photograph that you’ve got shows here a film being made – The Frog, with Gordon Harker. There was this detective, I can’t remember what his name was, but the ‘Frog’, he was the villain. Next to Uncle’s shop, used to have the pawn brokers Three Balls, and that was a, a fence. What was stolen last night in London, used to get sold there the next day. The police were always raiding it. And that’s where they were shooting that film. The other thing, because he was in all these films, and because all the agents were here, next to the Garrick Theatre, that big block there, all the agents were there, all these well-known film stars used to come in and see Uncle Johnny because they’d been in a film with him. And he always played character parts. Unfortunately, he used to get killed. And I used to get very upset because, at eight years of age, “They killed Uncle Johnny again!” He used to die well. Leslie Hardcastle: Oh, yes, I went there. The one in Piccadilly Circus was just very basic, just kind of rectangular shape thing. I think it could hold about 180 people. They weren’t large. Wayne Kirvin: There was one on Old Compton street. And there was one on the corner of Charing Cross Road and Old Compton Street. And they were news theatres, because people didn’t have tvs then. Leslie Hardcastle: It was pretty fresh what was happening reading the news on the BBC. Broadcasting hadn’t happened very long before the war. 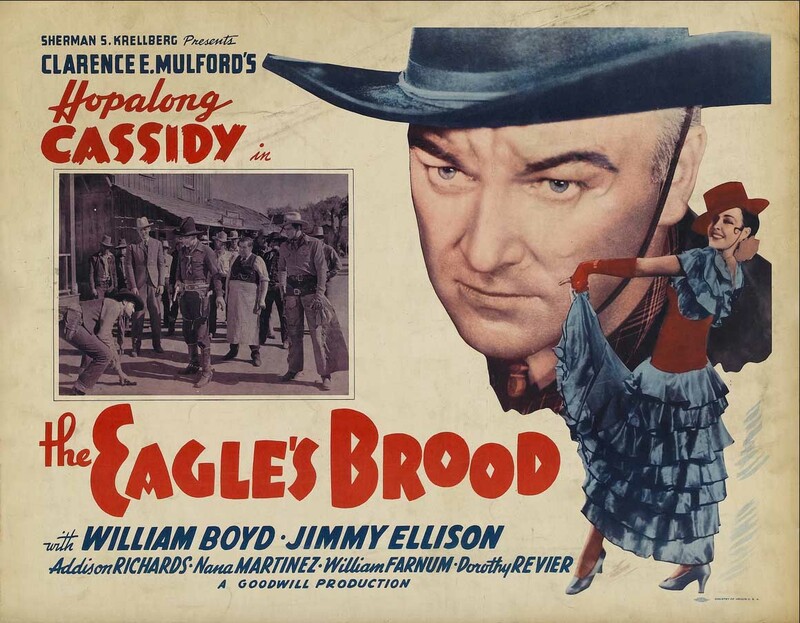 Leslie Hardcastle: And every cinema, themselves, used to have the news as well. But there used to be certain theatres which specialised in that, particularly in railway stations. Armin Loetscher (Sweetie): In Piccadilly, underneath, one hour and you see just news flash and all that, you know. Films like that, you know. There used to be one here, on the corner, Meard Street, it used to be a Kung Fu cinema. Used to be Kung Fu films there. I used to go there. 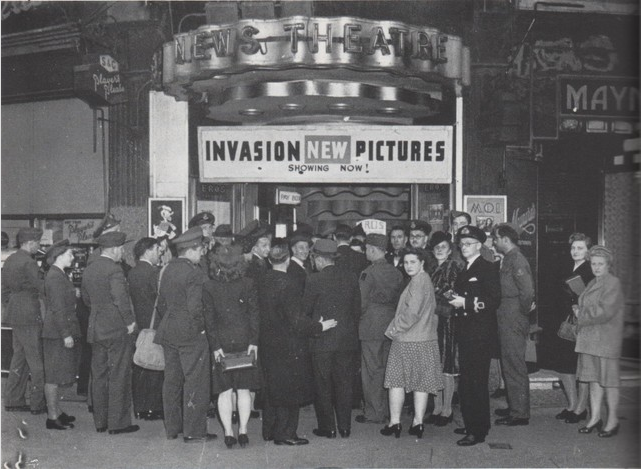 Leslie Hardcastle: In 1945, 1,460,000 people used to go to the cinema and that was all organised in Wardour Street and the streets around. Tim Miller: Soho was the centre of the film industry, absolutely. Pamela Power: All the main distributors, film distributors, were situated there. Their offices were there. Tim Miller: Like MGM and Columbia. 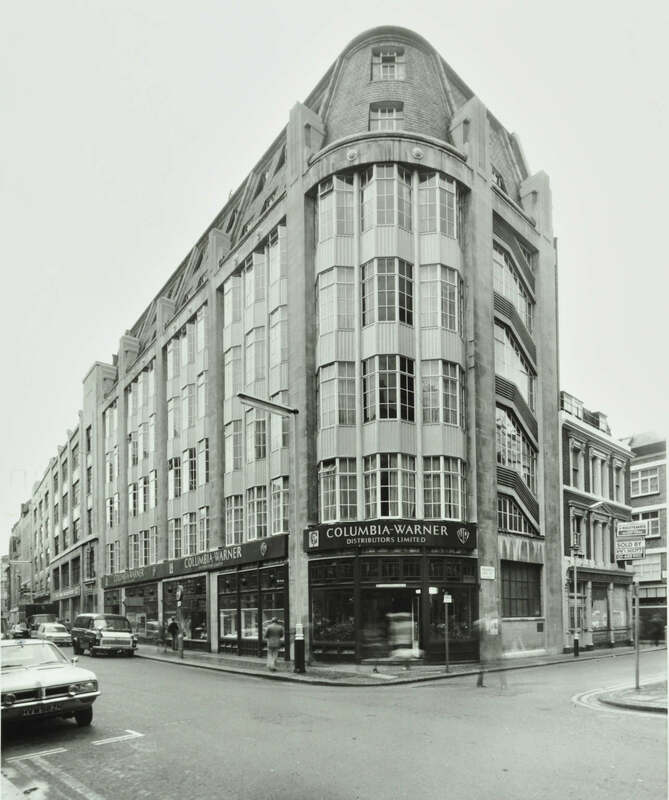 Columbia House was in Wardour Street. Leslie Hardcastle: Film House had Universal Pictures in it. Tim Miller: And lots, lots of viewing theatres. And preview theatres. Pamela Power: Where we would go and see rushes, or show an advertising agency a cinema commercial. Leslie Hardcastle: And you used to see in the windows the films that were to come. Pamela Power: Wardour Street windows, as it were, were always full of film posters and things. So, people would know from that point of view, this is the ‘film street’. Leslie Hardcastle: There’s three sections of film making in those days, and it’s still, to a certain extent, the same now. There are the people who make the films (film production), there are people who distribute the films and there the people who exhibit the films. Now the Rank Organisation had all three sections of it but that wasn’t typical, they were all separate. Pamela Power: My name is Pamela Power, I’m 76 and I was a film editor. I probably first went to Soho when I was working in a studio in Chelsea, with a man who had this self-contained studio. He had his own cameras, had a little sound room, had a make-up room. It was all self-contained, but there would come a point where the sound had to be mixed professionally. And so, the sound engineer would disappear to Soho. We were doing a commercial, which is what my employer, Keith Hewett used to do. Commercial television hadn’t been going that long. It was ’55 when it started and I suppose it was ’60 when I started work. So, it was still in its infancy. 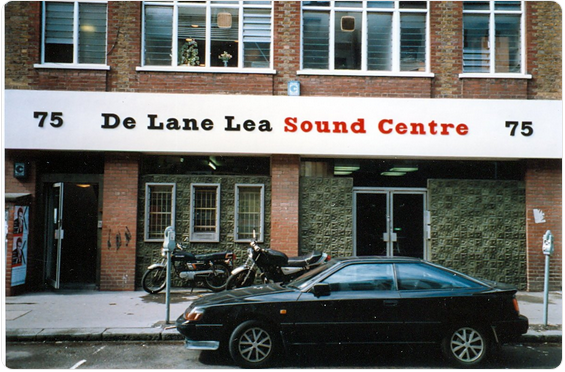 The first studio I remember was in a basement, as they so often were, with a company called De Lane Lea. And they were on the corner of Moor Street. And down we went. And it was a little cubby hole really, but it was perfect for what we were doing. Leslie Hardcastle: As far as production is concerned, I mean, London had more studios than Hollywood. They were not enormous, big studios, some quite tiny ones, but in number we had more studios than Hollywood. Pamela Power: I met this guy who was, I don't know, 6’4, name of John Wood, squeezed into this little cubical control area with John, with his desk with all the dials and the knobs and things on. And the commentator or the voice over would go into a little sound booth and record the script. And then John would mix it with sound effects or music or whatever we were mixing it with. And that was it initially. When everything was all finished, that film which was on magnetic, a bit like ¼ inch tape, but sprocketed stock, would then get sent to another transfer facility, and transferred to film, which was then sent to the laboratory, processed overnight just like pictures, and would come back on sprocketed stock which was blank except for this one black line along the edge of it which had little white squiggly bits and that was your sound. And then eventually that was obviously cut back to the picture and sent back to the laboratory to be coordinated because all stock had numbers on the edge, every 16 frames as far as pictures were concerned. And they had the negative that would match that. So they had our positive, they matched the negative they held to the positive, and cut it to match and then married them together on one print so that you had your pictures with the little squiggly line on the side. And we then had what was then called an ‘answer print’ from which we then graded the colour which could go back to the laboratory several times to be regraded and then that was your finished print. Leslie Hardcastle: Another thing, you could hear music – you could hear bangs, you could hear screams. But they were coming from the editing rooms. Pamela Power: The original machines that we, were editing machines, were either flatbed machines, which tended to be Steenbecks which were a German make. And you literally had plates and the film spools went on those plates and were threaded through the mechanism in the middle. Or they were what had been Hollywood machines, I mean dated from the certainly ‘30s if not ‘20s, called Moviola which were upright machines. And you could either, with commercials you could usually manage with the footage that you were using, to just stand and thread it through the machine as it was running. But it also had a spool system and you could put a spool of film in and view it and mark it up, if you were marking it up to be edited, and then gradually reduce it down, obviously, because they would shoot thousands of feet of film which got reduced to 93 feet and 12 frames for a 60 second commercial. Your hands and your shoulders, because you know you’re keeping the tension on the film, it was bad, it was tough on the legs. If you’re being really particular you used to have cotton editing gloves so that the film didn’t get your thumb prints all over it. Because you could get, you know, pretty sweaty when you were doing stuff. 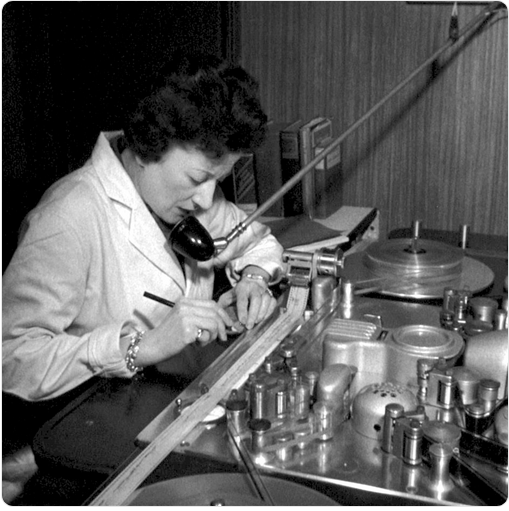 So, there were cotton gloves, there were Chinagraph which are wax pencils which you would mark the film up with, the cellotape for the cellotape joiners, the joiners, any extra bits that you needed for your editing machine – bulbs and things like that. If they went you had to have somewhere to go and get the spares. There were a couple of suppliers in Soho. One certainly on Wardour Street and one, I think, attached to the laboratory in Meard Street, where you could get your supplies. Before the Internet you used to have to physically go there and get them. There was one laboratory in Soho, and the one we used mostly was in a little alley way. Studio Film Labs, in Meard Street. The guys in the labs all wore white coats. It was pretty pungent in the rooms where the processing machines were. You knew you were in a lab when you walked in the door, that’s for sure. It was unusual for there to be one right in the centre of Soho. The others were out at Denham or Technicolour, which was by the airport. And it was fascinating, of course, to see everything going through. And then 90-odd prints would be printed of that, and physically be sent to all the television stations all over the country. Leslie Hardcastle: You used to see men rushing back and form with cans of film. But at that time, you had to carry these damned 35mm films around Soho. Pamela Power: In those days, when we were working on a film, which obviously uses a lot more physical film, I have been known in the past to walk the streets of Soho with a trolley absolutely loaded with film cans, going from the cutting room round to a dubbing theatre, or round to a viewing theatre, and for the film to be unloaded and given to the projectionist. Leslie Hardcastle: You know, a film is usually about 10 to 12 reels and there are 1,000 feet. Pamela Power: It was physically quite a heavy job at that stage. People would have been looking to see if they could read a label, or a side band on a can, to see what you were working on. Leslie Hardcastle: They were 1,000 feet because they were actually on nitrate film. 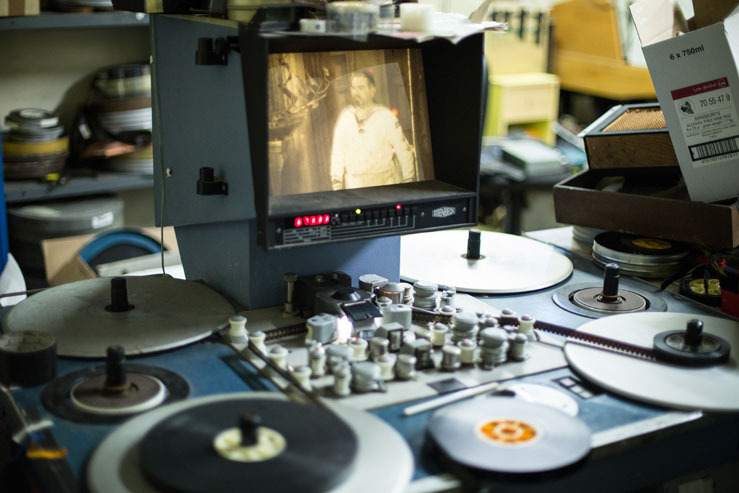 And it wasn’t until later on in the ‘50s that actually nitrate film changed into safety film. 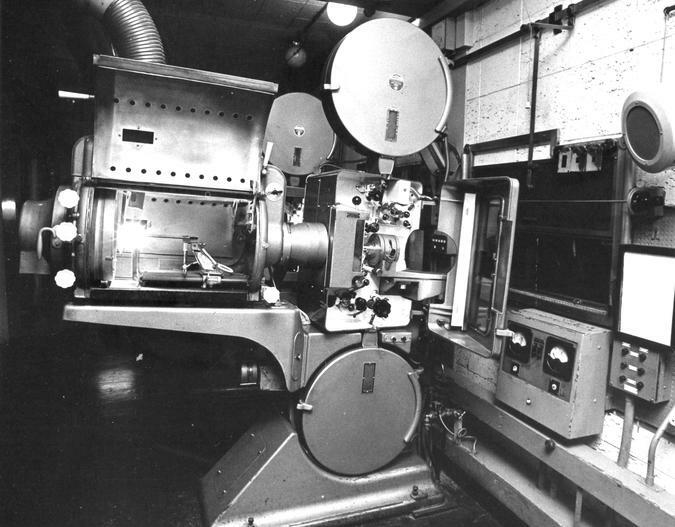 And you weren’t allowed to have more than 14 reels of nitrate film in any projection box. Although cinema gave the delight to everybody throughout England, nobody ever saw what was creating it. No one saw what a 35mm projector was like because it was all locked away in kind of pillbox with steel windows that went down if there was a fire. It was quite dangerous because if it actually caught in the projector it would set fire to the projector and maybe cause a panic in the hall. That’s why the projection boxes were always quite separate. Pamela Power: It’s quite weird, really, when you’re used to seeing things on a smaller screen. You might see them on a slightly larger screen when you’re dubbing the sound. Well, it will almost undoubtably be on a larger screen. But then, when you know that it’s being shown in a cinema, you know, in the West End or something, it’s slightly surreal, you almost can’t believe that you had anything to do with it! I know that sounds a bit ridiculous but it just takes on a bit of a different persona when it’s on a big screen. Wayne Kirvin: I used to know the West End cinemas. If I went to Leicester Square and saw the Empire Leicester Square or the Odeon Leicester Square, that’s where the film started. 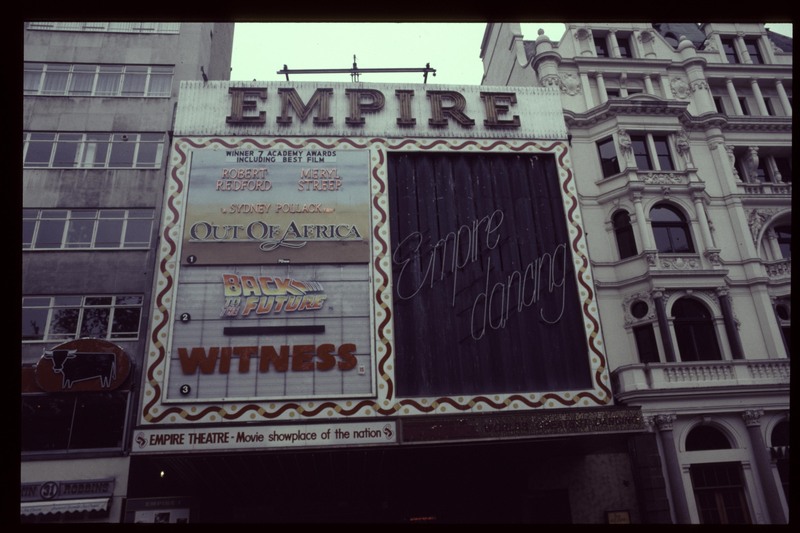 Michael Dillon: The Empire, yes, Empire Leicester Square. I remember going there, tatty. Yeah, I mean, I saw The Longest Day – about D-Day, 1963/64. 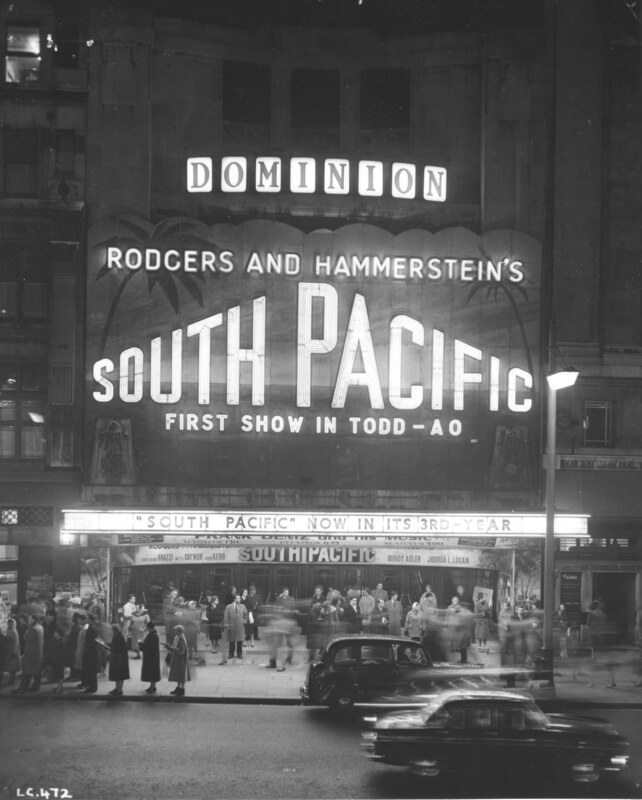 Wayne Kirvin: Then we used to go to pre-release cinemas like the Astoria in Charing Cross Road and there was the Dominion which had the same film forever like South Pacific was there for like two years. And Porgy and Bess was there for another two years. Can you imagine that? 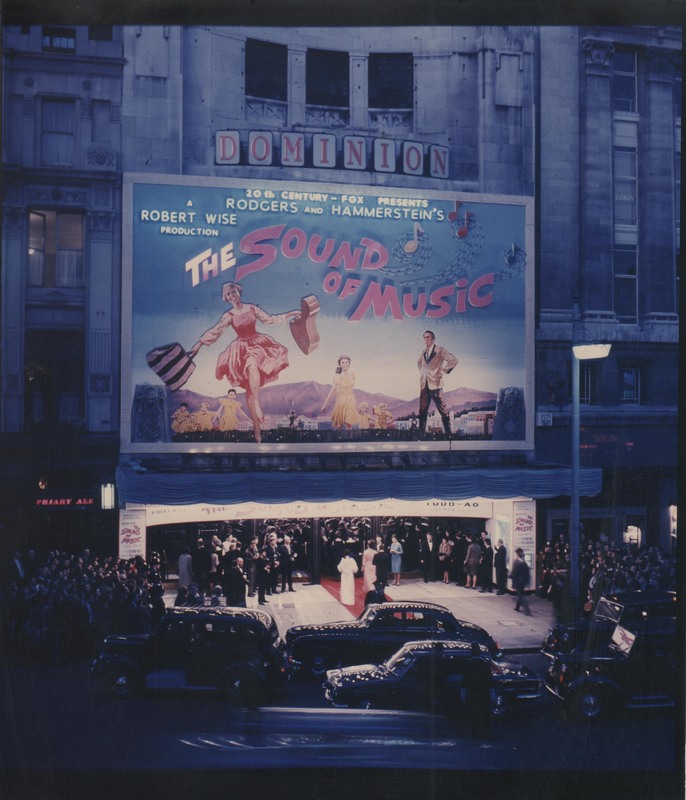 Before it became a theatre, it was a cinema, then the Sound of Music there for five years. It was amazing that cinema, the Dominion. 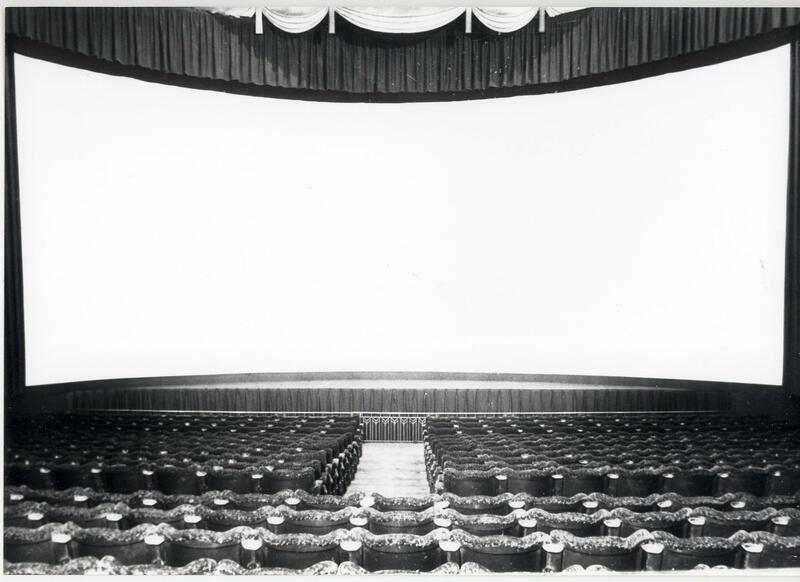 Michael Dillon: And Prince Edward became Cinerama. I remember seeing Grand Prix. The film was split into three different screens, quite amazing the way they did it. 1966, I think it was. But I had to go and see it three times, because I used to fall asleep. It was the midnight showing, because you could go all night to the cinema. [laughter] I never saw the end ’til the third time I went along. Leslie Hardcastle: My uncle got me a job in British Lion Films, which is a distribution company, and also a production company. And I started working there for the Contracts Manager. I wasn’t very happy there and one day one of the men there who used to deal with the British Film Institute which is a cultural organisation that started in Shaftsbury Avenue, in 164 Shaftsbury Avenue in Shaftsbury House. He said to me, “You’re not happy here. Why don’t you apply for a job as a secretary there?” And I went as a secretary to the booking agency, because there were over 1,000 film societies in England at that time, and 35 as well as 16mm substandard film societies. Because you weren’t allowed to go to the cinema on a Sunday. People forget that. Until the Cinematograph Act . And then when they did open under the Cinematograph Act, they said, “If you open on a Sunday you’ve got to give a proportion of that money to charity” and part of that charity was the British Film Institute and you've got to show cultural films. And I used to book these films because I’d come from the booking agency. 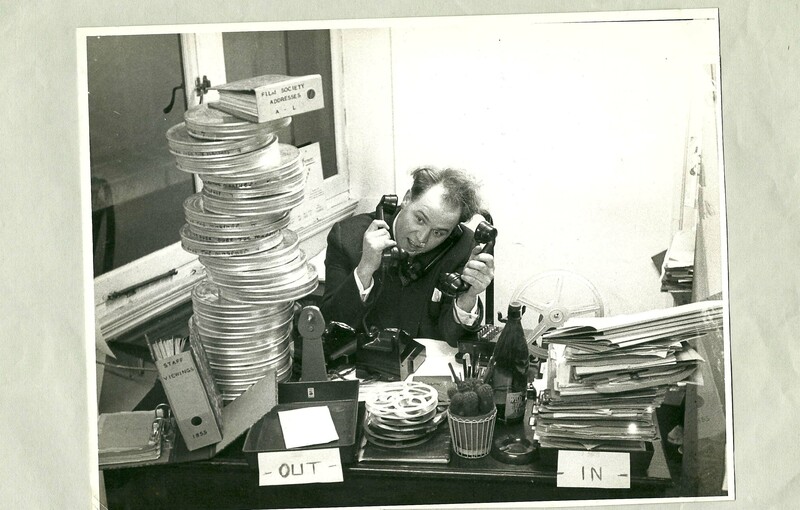 I helped to organise the first twenty London Film Festivals but the first festival we had nine films, they had about 260 this year. Well the British Film Institute has been moving around. It actually started in Great Russell Street, it got bombed there, and then it went to Shaftsbury Avenue, and then it moved into Dean Street. And then it moved into Charing Cross Road and now it’s moved up on to the other side of Oxford Street in Stephen Street which is in Fitzrovia. 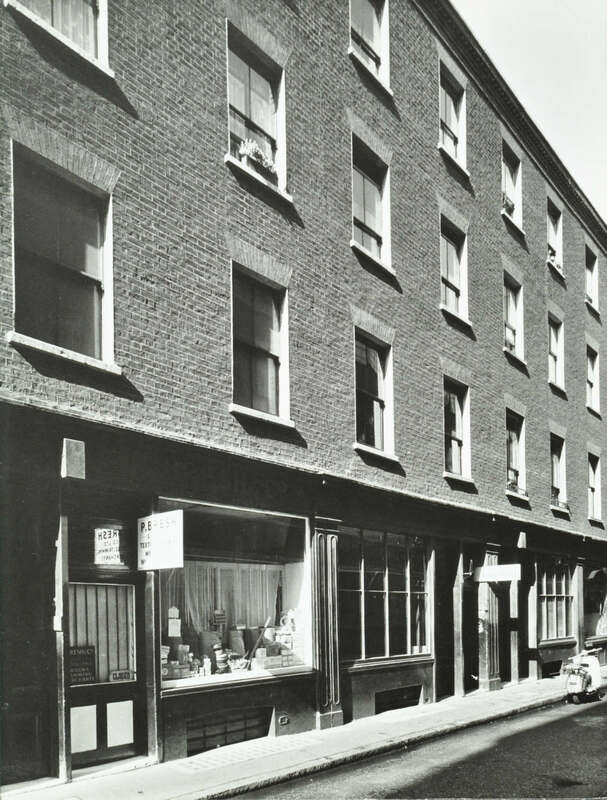 Pamela Power: When we moved into Lexington Street, there was a building on the opposite side of the road, which went the whole of the next block to Great Poultney Street. And there were wonderful old industries going on there. There was a glove maker, a military uniform maker, a flag maker – those sort of industries were in that building at the time. Because basically the whole of Soho was a village with all its extended activities. That building was demolished and re-erected, housing Goldcrest, and they had apartments above for people who were coming in from abroad to work on productions there. They could stay in the apartments. Quite often editors particularly would be working very late and so they might live out of town, so they would do a deal with the production company to be able to stay in the apartments. Goldcrest was built I think at the time of three day week, ’73 was it? By that time everything had gravitated toward Soho really. And by this time, John Wood, who’d been at the original De Lane Lea session, when I first worked in Soho, he had formed his own company and he had moved to Broadwick Street and had a studio there which again was the basement. Mag Masters was another one, which was in St Anne’s Court, they had, I think, three dubbing studios. But he too needed the space to do sound effects and that sort of thing. So all these places sprang up. But they were behind, you know, pretty straight forward doors. So unless you happened to see an actor going in the door or an actress, obviously, you wouldn’t know what was going on behind there. That’s the thing about Soho, you’ve got all this variety of doors and most of the time you've no idea what’s going on behind them. Some of which is probably a good thing but others leaves a mystery. Gradually more studios sprang up. There was another one at the other end of Lexington Street to our office. So it became a little microcosm of advertising in Soho. So although it had originally been a film area, that had sort of expanded into an advertising area as well, which encompassed film obviously, because we did films for the cinema as well. Tim Miller: My name is Tim Miller and I’ve lived here in Piccadilly for some 50 years which is about the length of time that I’ve been involved in Soho. My union as a filmmaker, the ACTT, The Association of Cine and Television Technicians, was in Soho Square. Alan Sapper was the Secretary General, General Secretary of the ACTT. And NATTKE, the National Association of [Theatrical] Television and Kine Employees was almost next door to it, near the French church. And the 20th Century Fox building in Soho Square, so naturally they were there. Pamela Power: Our building didn’t really change all the time that we were there. Obviously the people within it changed. But from the outside you would not know the difference because it looked exactly the same. The only thing that changed was the front door which went from a wooden door to a glass door, and that was about it. Each editor had their own room and, in the days of film, we had to have work benches, bins to hang the leftover bits of film into. We didn’t have a huge amount of space but there were two of us in a room, you know, an editor and an assistant. I think we had ten cutting rooms. We obviously had to go through the transition from film to video as well, which was a huge leap, mental leap for us, because we weren’t ‘of the age’ that were used to working on computers. When everything was becoming computerised we obviously had to bite the bullet and get a couple of machines, which in those days cost tens of thousands of pounds. But we had to get the machines in because we were already being seen as, you know, it’s called the Film Editors, are you working on film or are you working on these computers? And so we were going to start losing work if we didn’t get them. You know, you name it, we worked on it. Everything from apples to Apple actually. 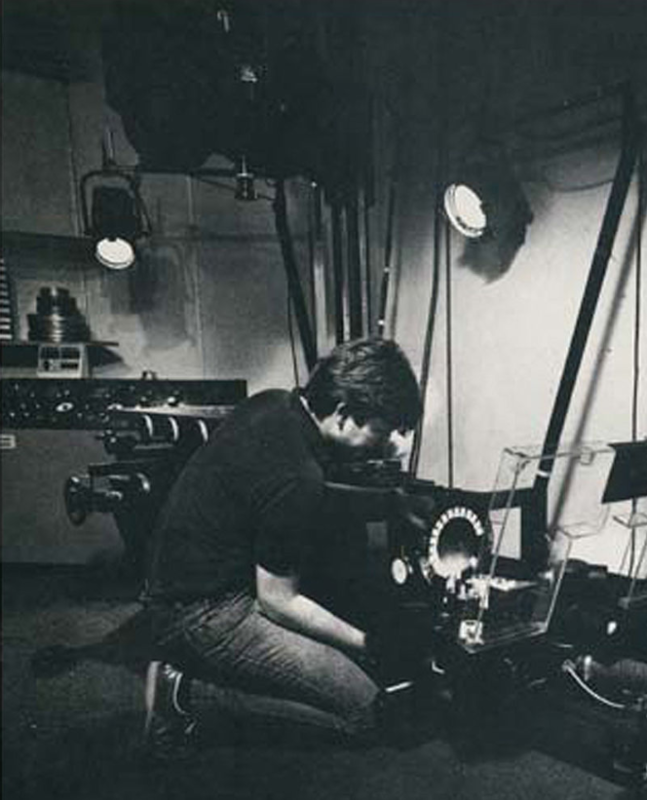 1984 was one of the ones that we did at the Film Editors, which was in 1984 would you believe? Because I think the Apple computer was, the big launch commercial was on their big New Year’s Day football match, or whatever it’s called, it was the one spot. So it was a big deal. We had that on Sunday afternoon with the agency. Well, Ridley (Scott) and I cut it together first, and then the agency, ‘cause they were in from California, they came to see it in the afternoon and that was it, that was it. Off it went. Well, we did the sound here. But they went back and were quite happy. Eventually obviously it all had to transfer over to the computers. We still had some of the machines when we closed the company down in 2006. A) we couldn’t bear to part with them and B) nobody else really wanted them because they were all going to computers as well. So it was a huge change in the industry. I was very fortunate to work in Soho at the time that I did. I loved what I did for a job. I love where I worked. I loved all the people I was working with I was with, the characters. The slightly dodgy looking people but nevertheless they were part of my area. And just felt, I loved it. I loved it. Clare Lynch: You’ve been listening to the voices of Leslie Hardcastle, Wayne Kirvin, Michael Dillon, Armin Loetscher, Tim Miller and Pamela Power, with added field recordings made by the Radio Enrichment Group at Soho Parish School. 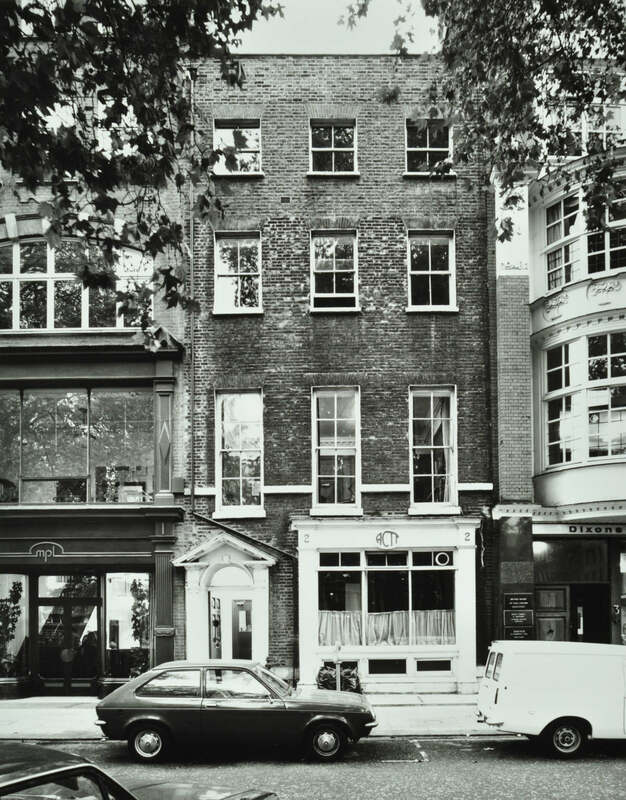 Soho Then is a photo-based podcast produced by Clare Lynch and commissioned by The Photographers’ Gallery, a Soho-based public gallery dedicated to photography. Soho Then is s financially supported by The National Lottery through the Heritage Lottery Fund and #MyWestminster Fund. With thanks to National Lottery Players. Thanks for listening and if you enjoyed the Soho Then podcast don’t forget to like and subscribe and tell your friends to listen too.